The Porsche Taycan will feature rapid charging, over 600hp and a driving range in excess of 500 kilometres. We’ll have to wait until 2019 before we catch our first public glimpse of the electric Porsche Taycan (pronounced ‘tie-can’), but early indications show that it will have all the right ingredients to make it highly desirable and a serious contender to other rivals such as Tesla and forthcoming models from within the Volkswagen Group, like the Audi e–tron. To date, only images of the disguised prototype cars have been seen publicly. But recently, 50to70 did get an exclusive look behind the scenes at pre-series cars being built. Just across the road from the impressive Porsche Museum in Zuffenhausen, up on the second floor, a team of 100 engineers are busy assembling pre-production models at a rate of two per day. These cars will join the intensive testing programme currently underway around the globe. Porsche is currently endurance testing the cars in every challenging condition possible. Engineers are also examining how the car stands up to the various public charging infrastructures in different countries. Unsurprisingly, photography wasn’t permitted, but we can tell you that the cars closely resemble the Mission E concept that initially previewed the Taycan. 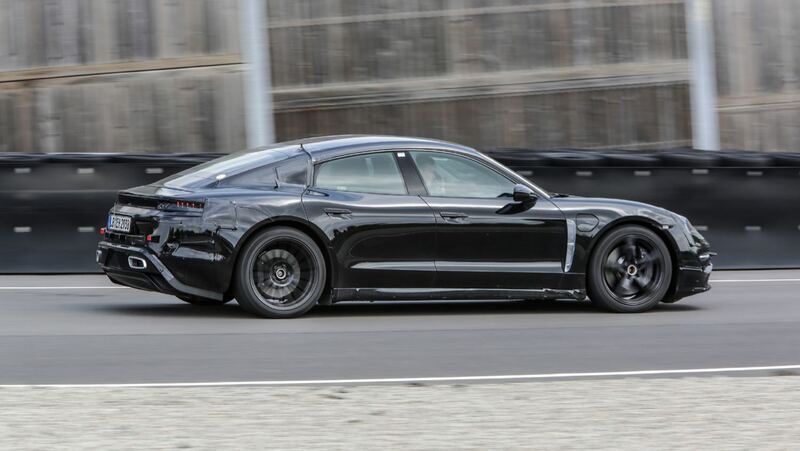 Porsche claims that the four-door Taycan will have a driving position that is almost identical to that of the 911. The car will feature seating for up to five with boot space in the front and rear. The Taycan’s high-capacity battery sits in the floor of the car, with cells positioned in a way to create deeper footwells for the rear passengers. Made up of 400 cells, developed by LG in South Korea and assembled in Germany. Porsche has built a dedicated new production facility specifically for the Taycan, close to the 911 line. It expects to produce up to 25,000 units per year there over two shifts. The company is confident that should the demand exceed supply, additional production will be laid on to meet demands. That will mean either a third shift or extra production at other facilities elsewhere in the group network. “We will be able to ship significant numbers in the coming years. We are capable of ramping up our production capacity substantially if demand exceeds expectations, we will be able to react accordingly,” said Lutz Meschke, Board Member for Finance and IT. He then went on to confirm that Porsche has already received over 10,000 orders for the Taycan. Porsche is also giving the production green light to a second model, based on the Mission E Cross Turismo. It is likely to become a Sport Turismo (estate car in Porsche parlance) version of the Taycan. With the new generation 911 just about to be launched, Porsche has said that while the new sports car is capable of utilising an electrified drivetrain. However, insiders say that it won’t feature in the car from launch. So, for now, the iconic 911 will rely purely on petrol power. With so many different powertrain options coming down the line, how can you choose what’s right for you? Here’s a useful guide to making the decision easier.